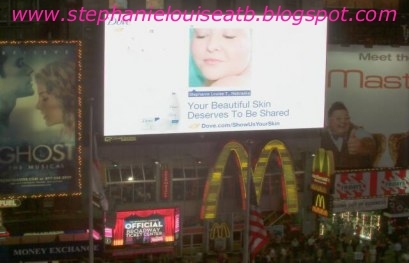 DOVE Puts Your Photo in Times Square & a GIVEAWAY! Let’s start off with this: Dove will put your photo in Times Square. Do I have your attention? All you have to do is take a qualifying picture (which is quite simple…just don’t be a perv or overly made up!) & submit it to Dove. They then e-mail you to let you know its approved (which happened that day for me) & then they e-mail you a snapshot of it in Times Square (the next day for me!) so you can squeal like me. I mean, I even called my mom. It’s easy – women simply head to the Dove® Facebook tab (http://on.fb.me/DoveShowUsYourSkin) to submit a photo* showing off their skin. Every woman who submits a photo will appear in a Dove ad – including a billboard in the famous Times Square and online digital ads. Women will be emailed a snapshot of their “moment of fame” on the Times Square billboard, and can share that photo with family and friends. Women can also go to Dove.com/ShowUsYourSkin to view the online gallery of all photos. The “Show Us Your Skin” campaign celebrates Dove Body Washes and Beauty Bars that give women soft, smooth skin they will want to show off! Dove® Body Washes and Beauty Bars give women beautifully soft and smooth skin they will want to show off, and only Dove® Body Washes contain NutriumMoisture™ technology that goes beyond moisturization to nourish skin deep down– so it won’t dry your skin like soap. So I’ve had a love affair with Dove for many years. In winter, when my skin aches & feels too tight, Dove is there to rescue it. I mean seriously, check out how rich this body wash is. It smells fresh & slightly cucumber-y. I love that it makes my skin feel soft year round but not oily or slick. I HATE residue, especially in hotter months when I feel like it gets everywhere. I love the comfortable feeling left behind after a shower & if I don’t use lotion afterwards my skin isn’t lacking. That’s a big deal! Please enter using the Rafflecopter widget below! If you don’t see it, give it a moment to load, refresh your page, or contact me directly & I will try to help! Sorry this is US only & please refer to my disclosure policy which has a special section just for giveaways! Good luck guys! & please feel free to e-mail me your photos & I will put them up on my blog! Enjoy your spotlight moment! ***This particular bottle of Dove Visible Care Body Wash was sent for review/giveaway but trust me when I say I’ve purchased loads of these myself!